The 37th World Zionist Congress, held in Jerusalem on 20 - 22 October 2015, has passed a resolution calling for all countries to recognise human rights violations against Jewish refugees from Arab lands and their right to compensation for seized property. 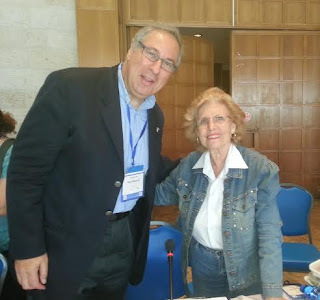 The resolution was proposed by Justice for Jews from Arab Countries (JJAC) President Elie Abadie through the Likud International, supported by MK Oron Hazan, Chairman of the Knesset Lobby for the Restitution of Jewish Refugees Property. Among those advocating for the issue at the Congress were Mrs Levana Zamir, chairman of the umbrella organisation representing Jews from Arab Countries in Israel, Meir Kahlon, representing the Israeli Sephardi Federation, and Mrs Esti Abadie. Levana Zamir hailed the resolution as a 'big step forward.' She claimed that the issue of justice for Jewish refugees from Arab lands was unknown to most delegates to the WZC. She added: "It is now a must to establish an International Fund to compensate both the Jewish Refugees and the Palestinian Refugees, stopping the Palestinian claim for a Right of Return." The resolution breaks new ground by demanding that every international forum discussing human rights, as well as accords between Arabs and Jews, should give 'precedence' to 'this distressing international issue': the human rights violations of Jewish refugees from Arab lands.